Mount Pellegrino is one of the granite covered mountains that dominates the landscape in Palermo, Sicily – and it begs to be hiked. Not all Italians may agree with my compulsion to climb to the top, though. Hiking isn’t a favorite outdoor activity here, but it is growing in favor. So in my quest to get to summit of Mount Pellegrino, I wondered how the trails were going to be. Would they be well marked? Getting lost on the way up is nobody’s idea of a fun day. As it turns out, our concerns were quite misplaced because of what lies at the top of the mountain. The path to the top of Mt. Pellegrino is paved. Or, more accurately, paved by the same granite stones that line the sidewalks throughout Palermo. This ancient road switches back and forth along the steep mountain, sometimes over raised walkways. 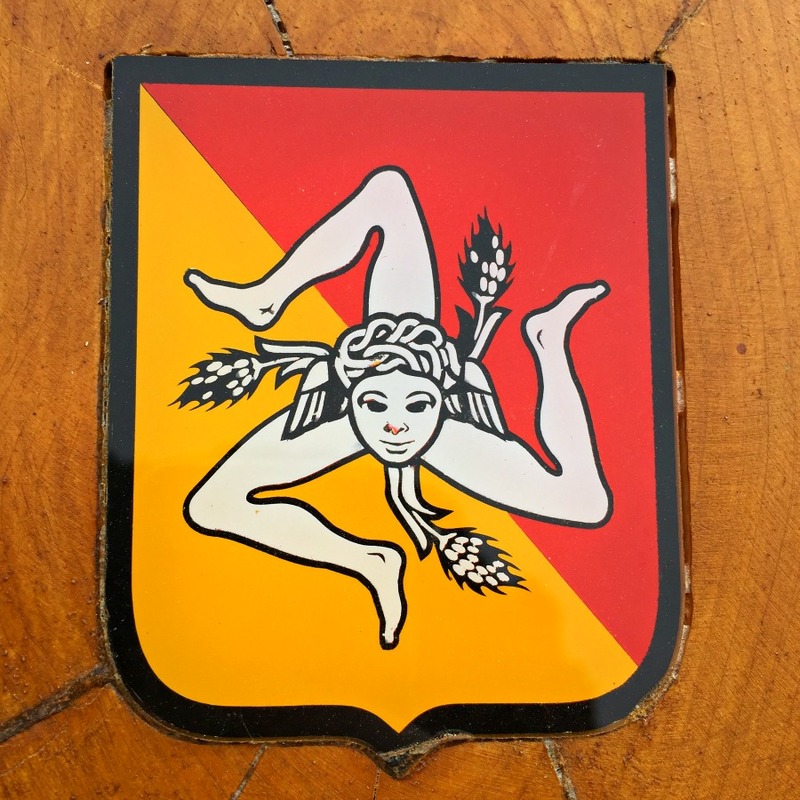 And the trail is well marked, appropriately, with the symbol of Sicily. It is an unusual design depicting is a head surrounded by three legs. There doesn’t seem to be clear explanation for this symbol. There are a few guesses by historians as to its meaning, but it’s been around for so long it’s embraced by the locals without question. You see versions of it available for purchase at every souvenir shop. The hike is steep in sections, but the views along the way are spectacular. 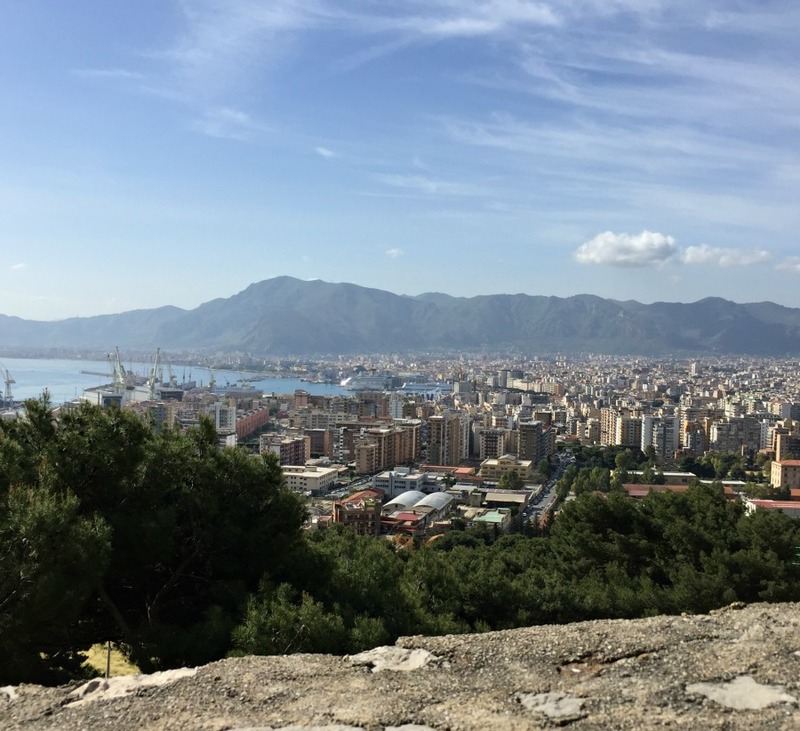 Early in the hike a sweeping panorama reveals the city of Palermo and its harbor. 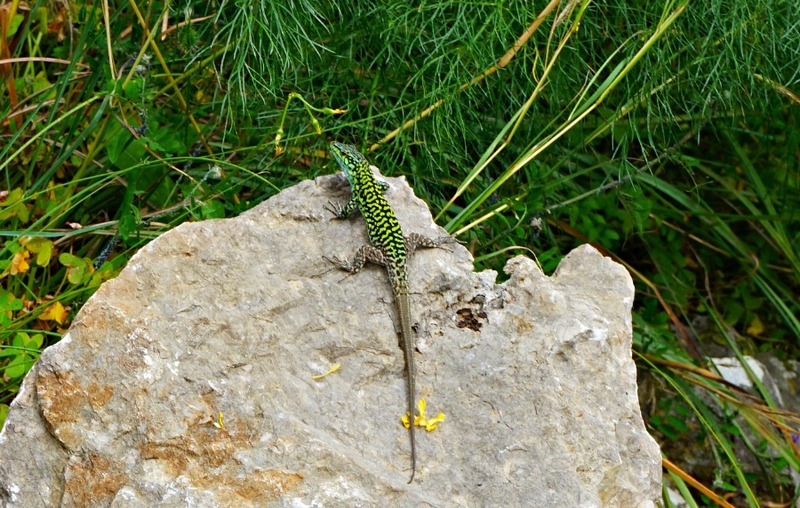 All the way along the suspicious rustling in the brush that accompanied our hike turned out to the be these colorful lizards. They sun themselves on the rocks along the side of the path. 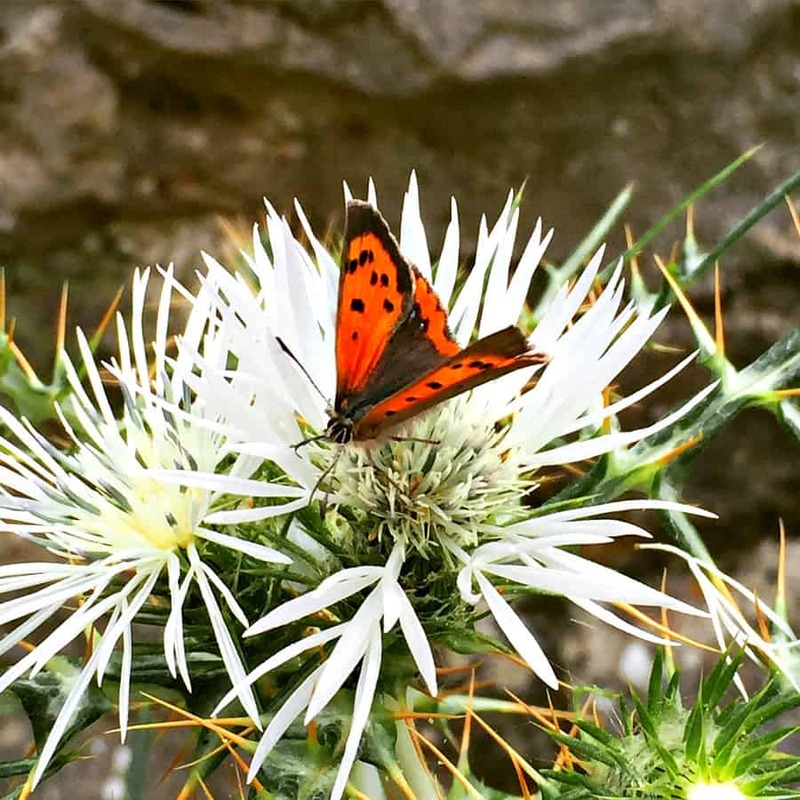 As the trail continues the view is dominated hills dotted with cacti and shaded wooded areas with wildflowers and thistles. 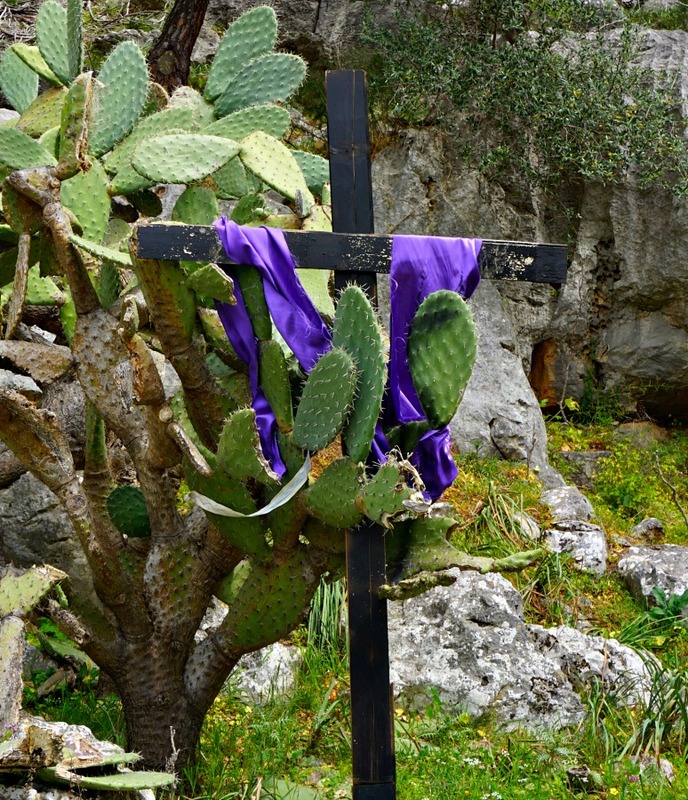 Along the way, we came across curious wooden crosses draped in purple cloth and shrines of various sizes. 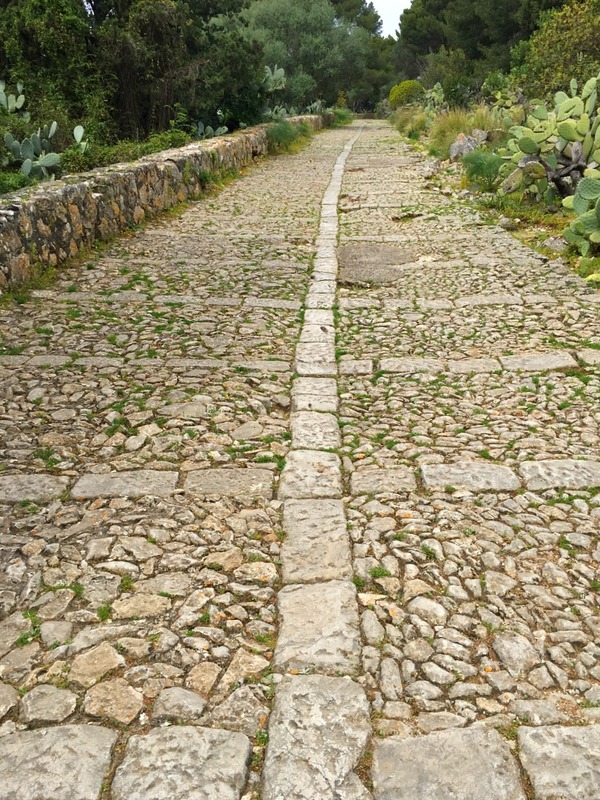 As it turns out, the path was constructed in order to lead the faithful to the Sanctuary of Saint Rosalia. 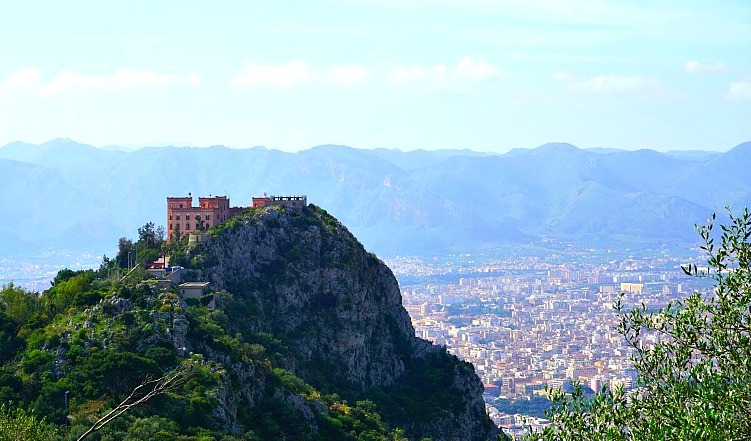 Legend has it that Saint Rosalia was the only one of the patron saints who answered the prayers of the citizens of Palermo in the time of their greatest need. In the 1600s, people were dying of the plague in alarming numbers. Only after the discovered bones of Rosalia (now affectionately know as “La Santuzza” – the little saint) were paraded around the city, did the plague end. 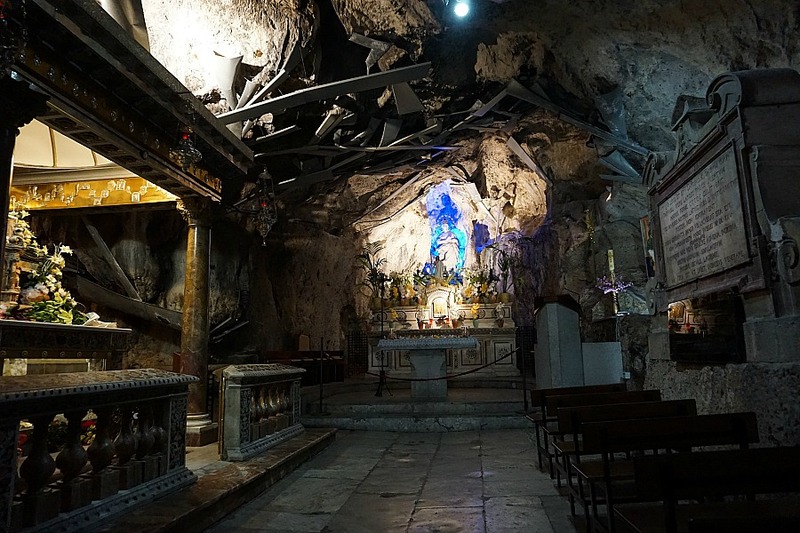 To give thanks, a sanctuary was constructed inside the cave on top of Mount Pellegrino. 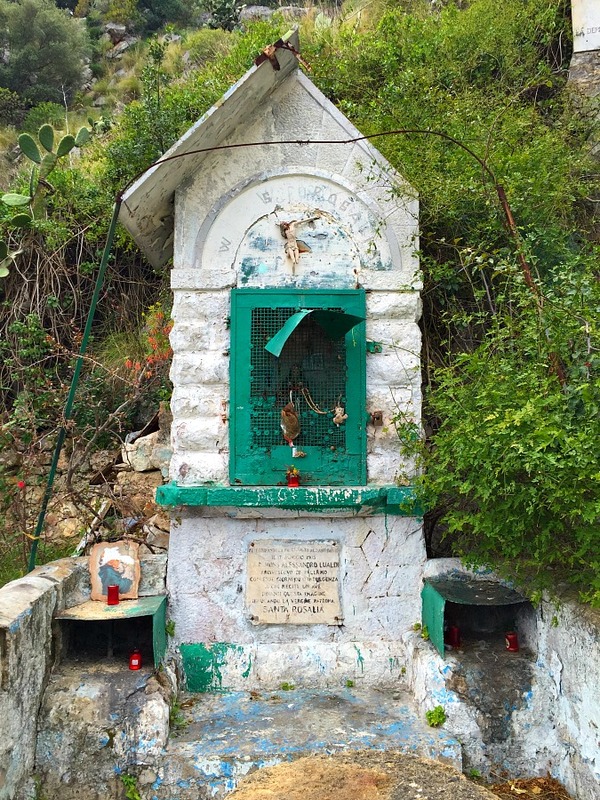 She was a devoutly religious hermit who lived out here life within the cave where her bones were reportedly found. During an annual tradition on September 4, many faithful pilgrims make their way up the path from Palermo to pay homage to La Santuzza. Quite a few make the trek barefoot, and others crawl the entire way on their knees. I shuddered at the thought as we walked with our sturdy hiking boots up the sharp granite stones. The fact that the bones that were found were later determined by scientists to be those of a goat have not dissuaded the faithful from their devotion to Rosalia. The trek and the visit to the unusual sanctuary, even absent of a spiritual quest, is well worth the effort. 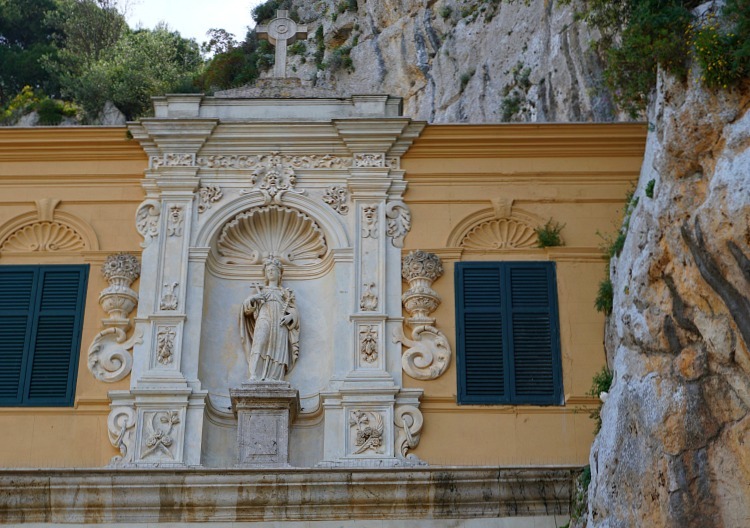 The beautiful formal baroque exterior gives little hint to the interior of Rosalia’s sanctuary. We walked inside and then deeper into the interior of the sanctuary. 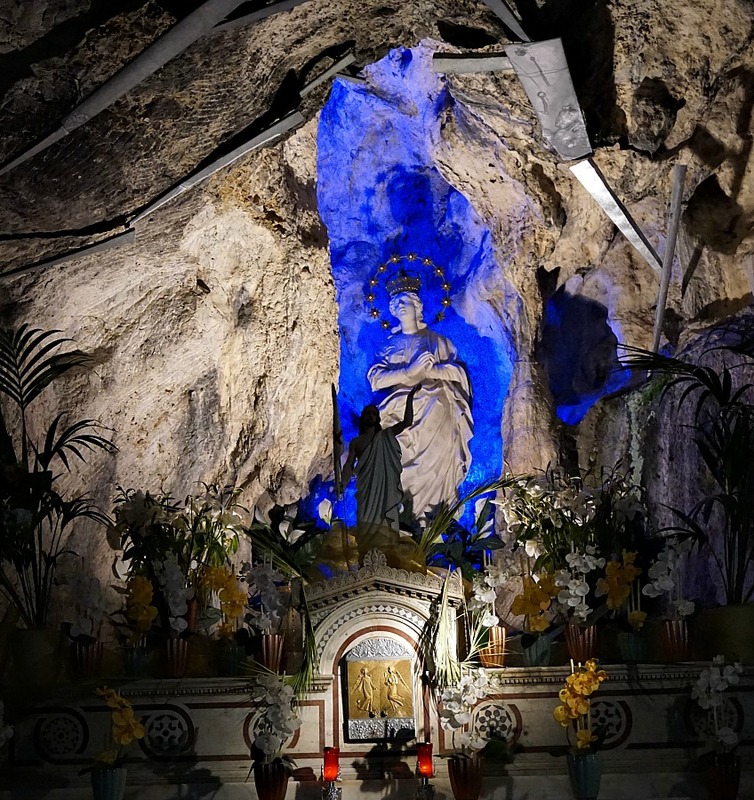 Now well inside the cave, we found intricate ornamental icons including a statue bathed in blue light. It is surrounded by offerings ranging from flowers, to notes, to motorcycle helmets. The juxtaposition is striking, unusual, and completely worth the hike on the slippery spiky rocks. 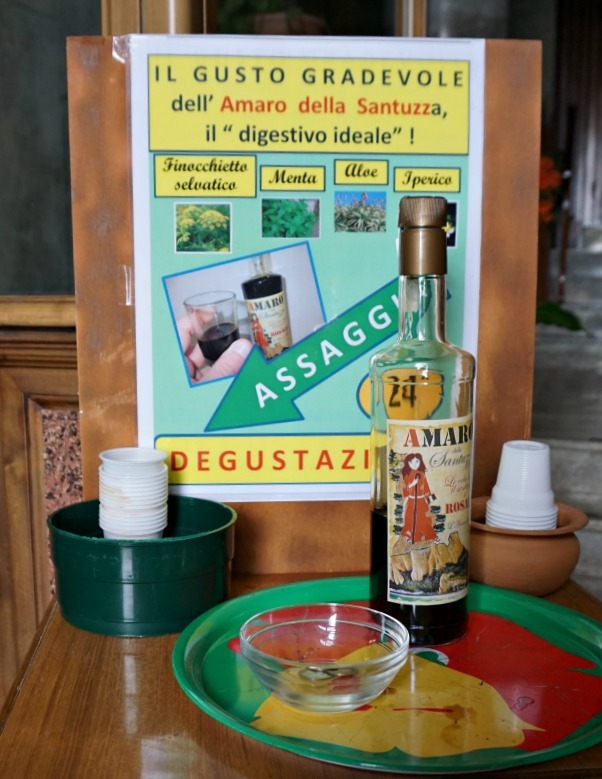 You can reward yourself for completing with journey with a little of Palermo’s famous digestive, Amaro Della Stanuzza. The liqueur is produced in honor of Rosalia with herbs that grow along the path. It wouldn’t do not to show your respect now would it? Even if you are just on your way through to the gift shop. If the idea of a steep 1 1/2 hour hike up the stony path doesn’t appeal to you, shod or not, there’s another option. 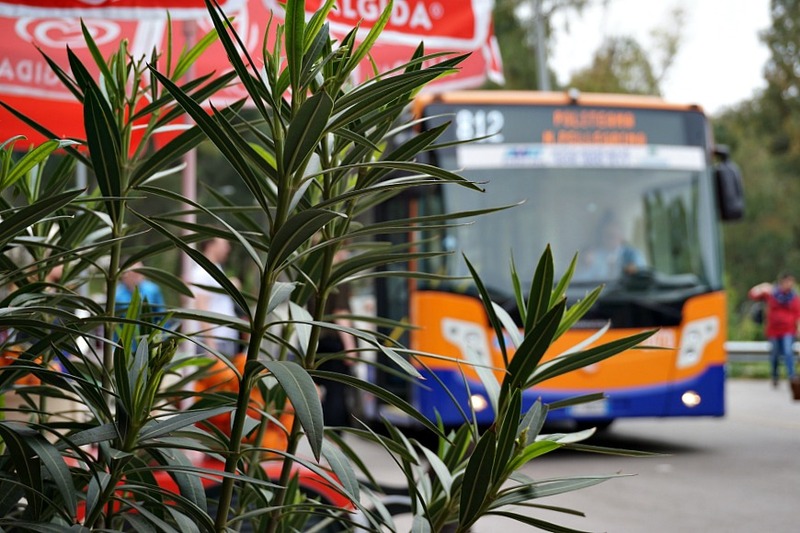 Take a seat on bus 812 and it will bring you straight to the top. Planning a trip? Visit our Resources Section for money saving tips, information about language learning on a budget and our recommended travel gear. 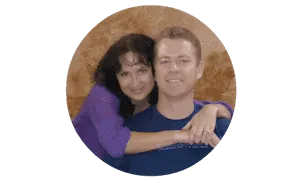 Note: Some of the links on this page are affiliate links, which means that if you click on them or make a purchase, we may make a small referral fee at NO cost to you. So click away! And if you do – thanks so much. We sincerely appreciate your support. I am going on a quick four-day trip to Palermo and hence, packing light. Are hiking boots necessary or can the I walk the trail in a pair of sneakers? I didn’t realise there would be hikes here. I don’t have any trainers only a pair of flip flops or sandels. I’m a hiker anyway so fit and healthy, as the path is paved do you think I’d be OK in those? Thanks in advance! The path is paved with stones, so I’d say that sandals would probably be ok depending on the type. I wore my basic everyday sneakers and didn’t have a problem. Have fun! !